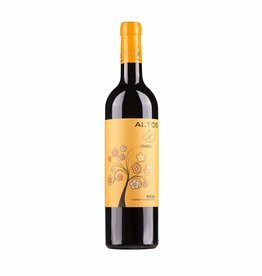 Altos de Rioja is a winery in the heart of Rioja Alavesa, founded in 2006. The makers are Jean Marc Sauboua, a well-known winemaker from Bordeaux, who also worked for Château Haut-Brion and Roberto San Ildefonso, who also owns Bodegas Sobreño in DO Toro. In addition there is Bienvenido Muñoz of the homonymous bodega from La Mancha. The aim was to produce elegant and modern Rioja wines using traditional methods. Best vineyards in the Rioja Alavesa, at a height of 700m, is the basis of this project, plus the know-how of the participants and the modern boutique cellar with the high-quality barriques, 80% from France (from the houses Taransaud, Saury & François Frères) and 20% American oak. This is where high-class Riojas are made at reasonable prices . The wine are realeased for sale when they are ready to drink and can still be stored for a long time.